For the last twenty years or so I have lived at Hay House. Hay House is the publishing company founded by Louise Hay and it has been the starting point for most of my studies into my own personal development and spiritual growth. I have been to lots of their events in London and beyond and read their books, bought angel cards and enjoyed audio recordings and more. Almost all of my favourite gurus and teachers are published by HH. I had a client who worked for them and another who pitched successfully to be published by them. Hay House is da bomb. I have much to be grateful to Hay House for. I think it is possible that, if memory serves me correctly, the first personal development workshop I ever attended was is London’s Islington on the topic of Louise’s own book, You Can Heal Your Life. I still use that book often, it is the material that taught me to love and accept myself exactly as I am and to (try to) do the same for you(!). I can even sing that to a tune “I love and accept myself, exactly as I am… tra la!”. Ask me next time we meet. And this week I downloaded the App of the same material – even handier than the book. But recently Hay House – alongside lots of other training companies I really rate – have started to introduce something which is even more helpful to me – live streaming. This means I can attend their global events worldwide from the comfort of my laptop and in my own time zone. Bliss. So a couple of weeks ago I felt inspired to sign up for the live online streaming of Hay House’s flagship event – I Can Do It. This is where they tour their authors round the world. I felt drawn to the agenda for the Washington DC event which was at the beginning of September, not least because the event in my home town of London UK was already sold out. It didn’t work quite as well as I imagined – initially – due to the time difference between London and Washington. My favourite, Wayne Dyer, opened the show on the Friday night at midnight my time so even though he was gripping, I couldn’t stay the distance until 3 a.m. but it was OK, because I knew that Hay House intended to give me access to the recordings a couple of weeks later. These arrived at the end of last week and I devoted much of my weekend to catching up. I watched fave Wayne all the way through, and was so pleased I did because the final sentences he read to camera were the precise words of a meditation I had been following, courtesy of his book Wishes Fulfilled, for about six weeks. And although I listen to this hour-long recording every day, I listen to it subliminally. It invites you to fall asleep while you are listening, so I was amazed to be able to say the words alongside Wayne reading them. I was so blissed out by the end of Wayne’s three hour opening talk to the I Can Do It Washington DC event that I felt absolutely fabulous and keen to watch more over the weekend. I caught up with Bruce Lipton, Denise Lynn, John Holland, Brian Weiss, Doreen Virtue and Gregg Braden over the next few days. I caught Joe Dispenza live but want to watch him again and also give Wayne another three hours of my time, such is the import of their messages to me right now I feel. And I still have Eldon Taylor, Alex Woodard and Caroline Myss to go, having caught Louise Hay and Cheryl Richardson on the original live stream. I have 90 days’ access to this and for this embarrassment of riches House House have charged me $50. Fifty dollars. FIFTY BUCKS! What abundance, that’s all I can say really. I have often spent much more in my life and received much less value. This in itself is an interesting debate which we are today enjoying in my Money-Making Magic Group too. HH appear to be moving quite solidly into making a lot of their events and trainings available online which is just such a fabulous development for me and it was beautiful to feel part of the event without being there live, and no less moving and informative. I imagine this must be incredibly valuable for the housebound and for those who cannot travel for reasons of finance or geography. As long as you have WiFi, you can be part of the Hay House experience either live or later. I have been very inspired by the speakers and their messages as ever. I am equally inspired by Hay House’s initiative to put this online and available to all of us around the globe. There are still several I Can Do It events coming up which you may be able to enjoy on the same basis: Pasadena, New York, San Jose, Austin, Vancouver, Atlanta and Toronto in 2012/13. There will be one to suit you. 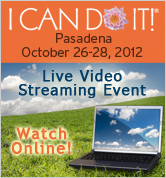 I’m not sure if they are all being live streamed but Pasadena and New York definitely are – enjoy!